Whether his opponents are willing to recognize it or not, President George Herbert Walker Bush lived an extraordinary life. At 18, he was the youngest enlistee in the U.S. Navy during World War II. From June 1942 to September 1945, he served bravely (58 missions and 125 carrier landings), rising to the rank of lieutenant. The rest of his resume has become the stuff of legend — a degree in economics from Yale; a successful business venture with Zapata Offshore Co. in 1954; on to the House of Representatives as the winner of the 7th Congressional District of Harris County, Texas; U.N. ambassador; envoy to China; CIA director, vice president under Reagan; and then the White House. As president, Bush fought for the reunification of Germany, even against the arguments of Margaret Thatcher; managed to bring the Cold War to a peaceful end; and basically reorganized Europe. The Americans with Disabilities Act and the Clean Air Act of 1990 were both groundbreaking pieces of legislation. Bush was more than a transitional president; he was a man who wanted to accomplish important things and had the vision necessary to carry forward his ambitious goals. However, there is a pattern to Bush’s career that cannot be simply glossed over by those who want to turn him into a paragon of virtue and high-mindedness. From the very beginning of his career in public office, Bush showed an unnerving capacity for betraying his own values. At Yale, he claimed to be devoted to the ideals of democracy and social equality; yet he joined Skull and Bones, one of the nation’s most elitist and ultra-secretive organizations. Early in his political career, he campaigned as a moderate; yet when he was running for a U.S. Senate seat in Texas, he came out against the landmark Civil Rights Act of 1964, deriding his opponent as “radical” for supporting the bill that ended segregation in public spaces. As RNC chairman, Bush advocated for a free press and the supremacy of the Constitution; yet he positioned himself as a willfully ignorant spokesperson for Richard Nixon. On Sept. 14, 1973, Bush appeared on “Face the Nation” to defend Nixon’s role in Watergate, essentially chastising the press for even daring to ask the president questions. Later on, as a candidate for president, he promised voters that he would champion a “kinder and gentler America”; yet when presented with a choice to run the infamous Willie Horton commercial, Bush gave his campaign team the green light. For someone who supposedly embodied the highest standards of civility, the spot turned out to be one of the most blatantly racist ads in modern political history. As president, Bush was staunchly anti-imperialist; yet he authorized the armed invasion of Panama in 1989, an act of military aggression that the U.N. General Assembly determined was a “flagrant violation of international law.” That conflict was waged without approval from Congress and cost at least 1,000 Panamanians their lives. Panama, we know, was just a dress rehearsal for the Persian Gulf. For a president who claimed wars of aggression are evil, and that proportionality in war is a moral imperative, the Persian Gulf War led to the devastation of Iraq’s infrastructure, resulted in the death of thousands of innocent civilians and laid the groundwork for the illegal invasion of Iraq in 2003. And the hypocrisy didn’t stop there. A supposed champion of women’s rights, Bush nominated Clarence Thomas for Supreme Court. A man who believed that elected officials have a sacred duty to serve the greater good, Bush intentionally neglected to invest in public health education and treatment during the AIDS epidemic. A man who took over the CIA in order to rescue the institution from its reputation for criminal mendacity, Bush lied to the American public about his own history in the CIA dating back to the ’50s. 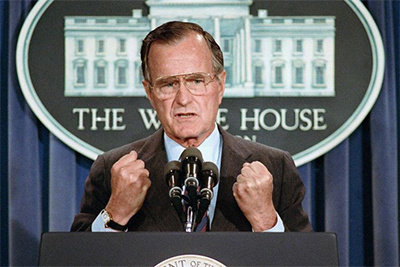 A man who believed that a president should never obstruct justice, Bush did just that when he pardoned Caspar Weinberger and others for their participation in the Iran Contra scandal. I really don’t mean to put a damper on the encomiums. As I stated, Bush lived an extraordinary life. Compared to the current POTUS, Bush was a man of etiquette, magnanimity and commitment to compromise. But any honest assessment of his legacy must take into account the man’s shortcomings, acts of impropriety and political failures. As significant as his accomplishments were, it was his miscarriages of justice that caused the most damage — more than 100,000 Iraqi children dead, entire communities decimated by crack cocaine and AIDS, death squads in Latin America, and, one can argue, the creation of a Republican base that combined the most radical elements of the Christian right with the most hawkish elements of the neocons. One must ask, would there be a Donald Trump in the White House if not for the foundation George H.W. Bush laid in Harris County way back in 1963? So yes, I agree wholeheartedly that President George H.W. Bush was a remarkable man. But history will not be as kind to him as the past few days suggest. George Cassidy Payne is an independent writer, social justice activist and domestic violence counselor. He lives and works in Rochester.